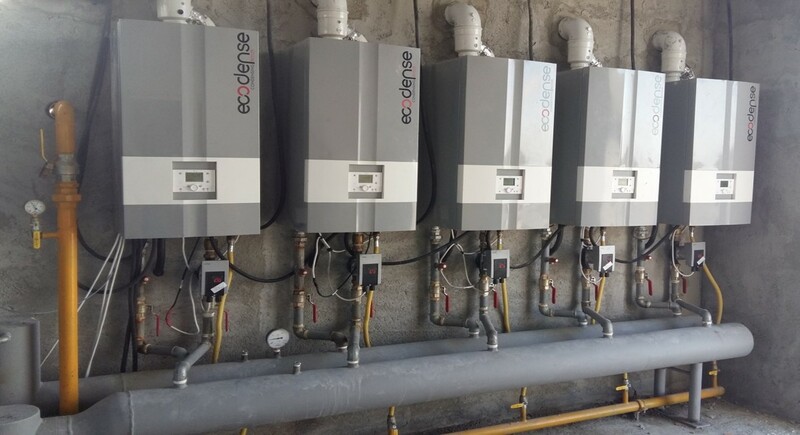 Commercial Gas Boilers – These are available in both Natural Gas and LPG, and with an output range for these Ecodense Boilers is from 45 kW to 150 kW ,in a wall hung configuration.These modulating commercial gas condensing boilers, provides energy saving through a 5:1 modulating operation, These gas condensing boilers can be installed directly on the wall thanks to their power, reduced size and low weight, freeing up valuable space inside the boiler house .These boilers are modular boilers, and can be coupled together in a commercial gas boiler cascade configuration which you can think of as multiple boilers within “One Total Boiler” as such, this give this range of Commercial gas boilers , a few distinct advantages when compared to others, in that – If one heating modules / boiler goes down or malfunctions, you still having the remaining modules/boilers to provide you with heat, thus increasing reliability , which can be vital in applications like nursing homes, hospitals etc. 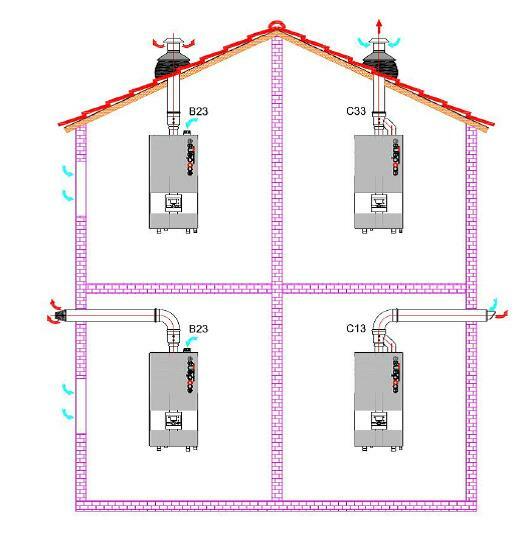 Furthermore,these multiple boilers , when in a cascade configuration have power control boards that communicate between them and handle the power output of every module in a uniform and coordinated way in order to guarantee the maximum efficiency, matched to the heating load.The performance and dimension of the Ecodense commercial gas boilers and a wide range of power outputs make it one of the best gas condensing boilers to use in any wet heating system installation, be it radiators, radiant panels, fan-coils,underfloor heating etc and to install in any boiler house, in either new or when replacing existing boilers in any buildings, houses, hotels, schools, factories, etc. The NOx Class 5 (<40mg/kWh) level for all these commercial gas fired boilers ensures maximum BREEAM points. 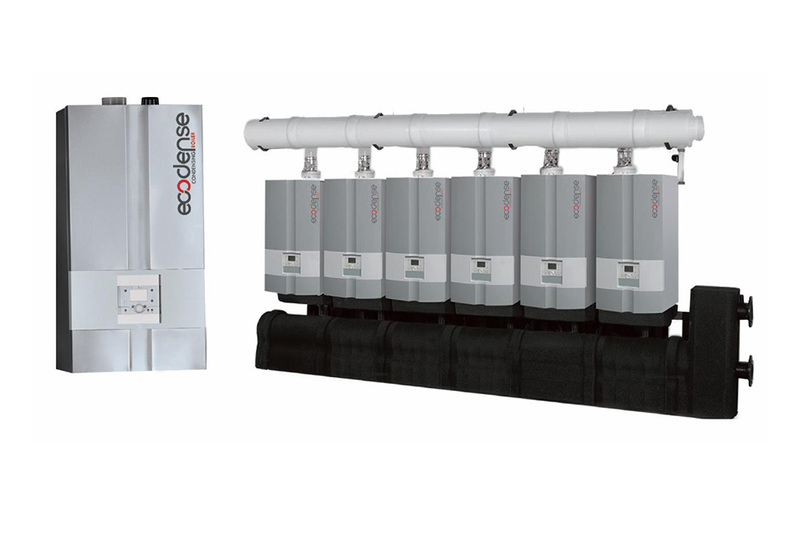 INNOVATIVE DESIGN, COMPACT, POWERFUL, & LIGHTWEIGHT – The Ecodense are designed to be “space-saving”; thanks to their vertical structure they allow to save space in both new and to renovate thermal power plants. They supply an output up to 150 kW in the wall hung version and thanks to their lightness they are easy to carry and to place and mount inside the boiler house. WIDE TURN DOWN RATIO 1:5 -The perfect synchronous of heat exchangers cascade sequence control and “rotation”, combined with the air/gas mix system, allow a wide turn-down ratio of 1:5 for Ecodense 150kW and up to 1:80 in case of using 16 Ecodense 150kW models in cascade sequence to reach an output up to 2400 kW. WT-S Range – STAINLESS STEEL HEAT EXCHANGERS -Each heat exchanger is made without weld joints and it is able to bear a working pressure up to 6 bar. ECOLOGIC PREMIX BURNER -The whole range of boilers is equipped with ecologic premix burners made of Fecralloy metal fibre. The WT and WT-S range of Condensing wall hung commercial boilers are suitable for use on sealed systems and open vented installations ( with a minimum of 0.8 Bar Head) and perfect for both new and retrofit installations. Horizontal flue kits and extensions must be connected to the boiler at minus 1.5° to minus 3° angle in order to drain the condensing fluid. Flue type B23= Flue gas evacuation is achieved with a flue gas duct between the boiler room and the outside.Combustion air is sucked from the boiler room. Flue type C13= A horizontal concentric air/flue gas duct is used for flue gas evacuation and suction of the combustion air. Given the number of acts and regulations that are in force regarding the siting of flues, Flexiheat UK always recommends that advice is sought from a specialist flue installation adviser to ensure all national and local regulations and requirements are closely observed. Systems up to 70kW net must comply with British Standards, which recommends that all fanned flue terminals should be a minimum distance from any openings into a building. Also, consideration must be given to buildings directly opposite or adjacent to a flue termination. 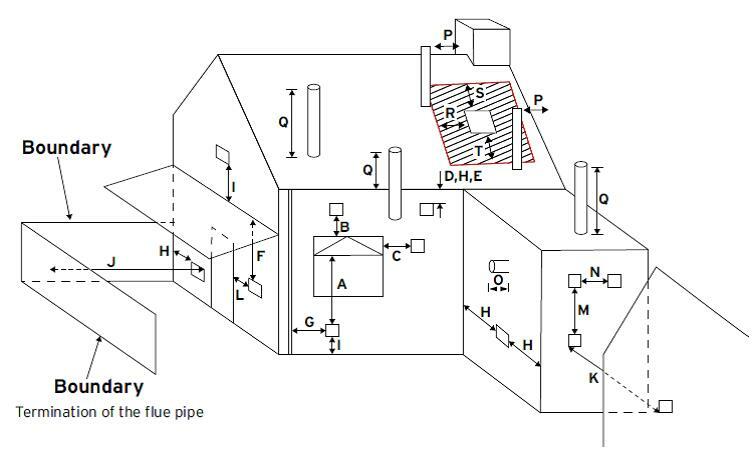 When siting a flue terminal, the products of combustion must not be discharged straight across a boundary and there are minimum distances for terminating beside a boundary. In all cases, the possibility of the plume of condensate touching building fabric or discharging where it may be considered a nuisance or where they may not freely disperse must be avoided. The diagram below is relevant for the installation of boilers with a gross heat input > 70kW net but less than 333kW net input. 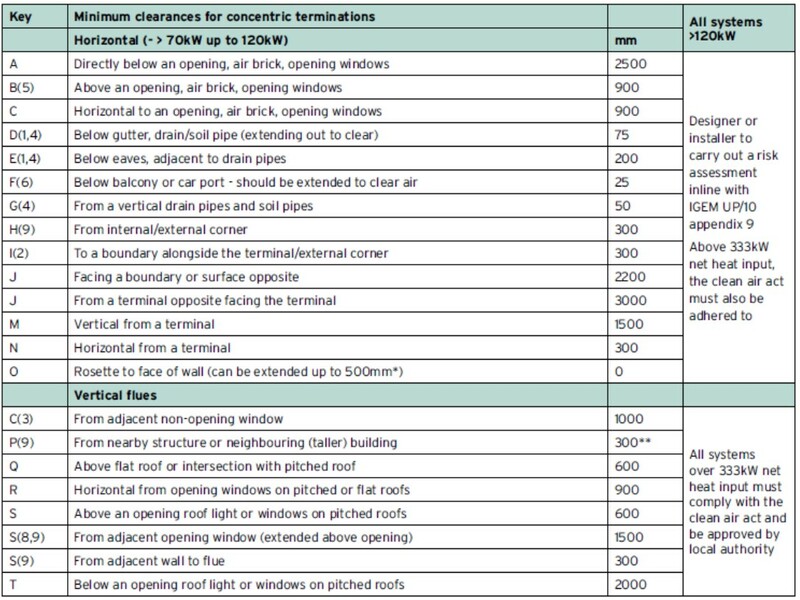 For further guidance see the current IGEM UP/10 risk assessment appendix for guidance on suitable flue terminal locations.For installations above 333kW net input, refer to the “Clean Air Act,” as the discharge of flue products must comply with the stated and calculated distances above ground (see note 3).It is essential to ensure that discharged flue products do not create any hazard or nuisance to persons within the discharge area and do not come into contact with building surfaces or build-up within an area where they may re-enter a building. 1. None of the above installations should discharge into a courtyard, light well, car port or enclosed environment. 2. Care should be taken to ensure that even if the installation complies with the minimum dimensions shown below, that all site conditions are taken into consideration to avoid the plume becoming a nuisance or causing wall staining. 1. There should be no ventilation/opening in the eaves within 900mm of the terminal. 2. 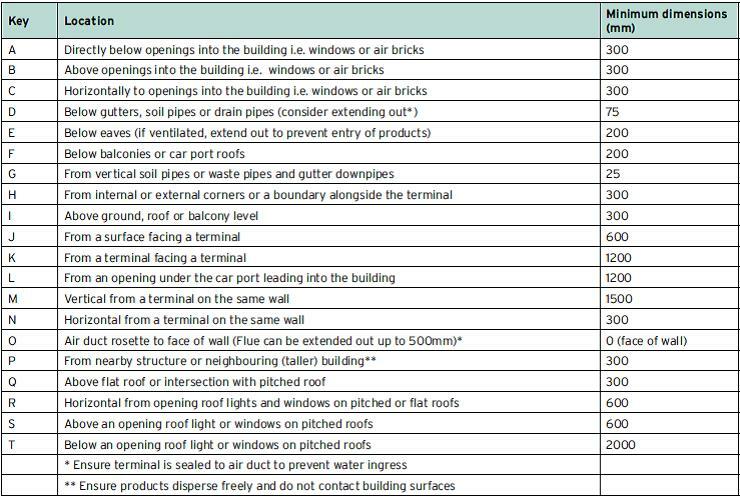 These dimensions comply with the building regulations, but they may need to be increased to avoid wall staining and nuisance from pluming depending on site conditions. 3. It is recommended that an elbow termination is fitted to direct the plume away from the window. 4. If the pipe is shielded from the heat, this dimension may be reduced to 25mm. 5. The flue through the roof should not be located within the shaded area. 6. It is recommended that the terminal should not be located below 2 metres in any occupied space. 7. Terminals below 2 mtrs must be fitted with a suitable terminal guard and should be a minimum of 300mm above surface level. 8. It is the installer’s responsibility to carry out a suitable risk assessment to ensure the location of the terminal is safe and products can freely disperse without causing nuisance or harm to persons.Please refer to IGEM/UP/10. These Commercial Gas Boilers can be used in a cascade configuration of up to 16 Boilers , with the potential of 2,400 kW of Heat Output for the WT range (Aluminium heat exchangers), or 1,040 kW for our WT-S range ( Stainless Steel heat exchangers) , making them the ideal commercial boilers for Schools , Hospitals , Hotels, or any Commercial or Industrial site that requires heating via a hot water system.With a turn-down ratio of up to 1:80, these commercial boilers are the best option when you want to match your heating load, at the very best efficiency levels , giving you the lowest gas costs / gas usage. 1 – Selectable system control language from the languages defined in languages options. 2 – You can control the system using a weekly time program and set the system to turn on and off 3 times a day. The system operates in comfort mode during programmed periods and in economy mode at other times for economic use. 3 – Controller can be used to add holiday /vacation mode for the heating circuit. During a holiday/ vacation period, the heating circuit operates according to the frost protection temperature or economy temperature for energy efficiency. -The device can operate in 3 different temperature modes: comfort mode, economy mode and frost protection mode. -Heating curve can be adjusted depending on climate conditions. -You can use the underfloor drying function / program to adjust the heating temperature for a newly finished floor. 5 – For Domestic Hot Water production ( via a calorifier / hot water cylinder ) , the same settings as the heating circuit are available. -Domestic Hot Water ( via a calorifier / hot water cylinder ) and the heating circuit can operate at the same time, or the Domestic Hot Water can be prioritized using priority assignment. -The Anti- Legionella function can heat the domestic hot water to high temperatures at specific periods to eliminate the Legionella. 6 – The last 20 errors in the control device can be viewed using the relevant parameter. 8 – Swimming pool heating is possible using solar power and these commercial gas boilers. 9 – Cascade module can allow the system to operate as cascade. – Prevents frequent activation and deactivation of boilers. 11 – Maintenance and special operation menu can be used to define maintenance intervals. The boiler’s operating times can be measured, service signal and maintenance time alert can be issued at specified intervals and the time since the last maintenance can be checked. 12 – Commissioning mode can be used to conduct inlet/outlet tests of equipment during commissioning. 13 – Room units can be connected to the control device. Room unit can be used to control the heating circuit. These Condensing Gas Boilers can be equipped with an Siemens OCI345.06 Cascade Module interface that allows the control of up to 16 boilers, including 1 master and 15 slave boilers, to be controlled, through 0-10V analogue signal or MODBUS digital signal. 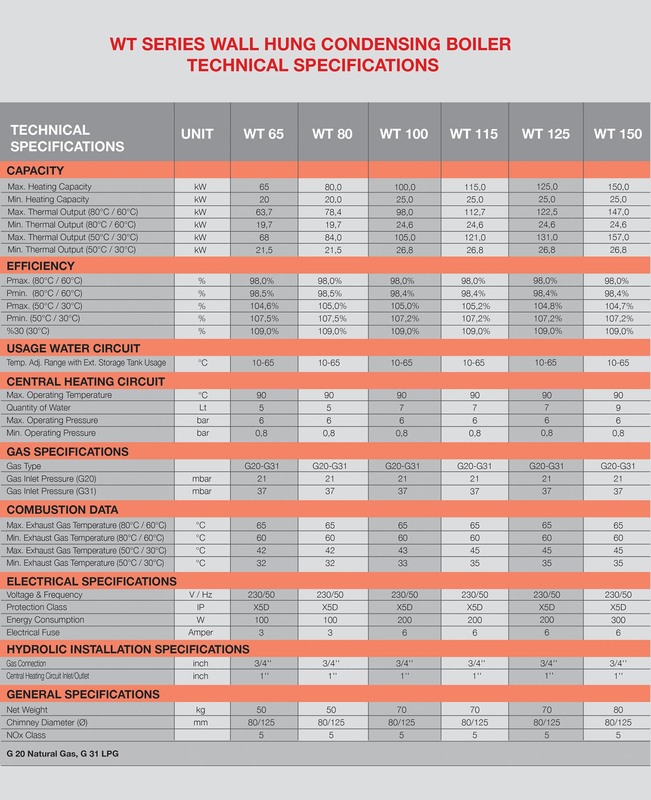 These control options are often required for commercial gas boilers making them particularly suitable for commercial, industrial and communal or centralized plant heating systems. The installer or maintainer can then configure, monitor and remotely control the entire operation of the gas boiler, helping to reduce energy consumption and at the same time lowering the cost and frequency of maintenance required. Should you require anymore assistance or information on our Commercial Gas Boilers / Commercial LPG Boilers / Commercial Cascade Boiler , please don’t hesitate to contact our sales team on 01202 822221 or click here for our email contact form.